The pictures tell the story of my daughters first bike (this weeks lesson in norwegian: sykkel=bike...LOL). The bright pinkt patterned paper is Glitz, but the other one I do not know. Title is cut from cricut Hello Kitty font! 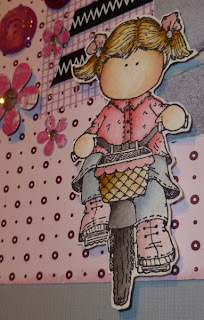 This cute little girl is a stamp from the swedish producer Hänglar & stänglar, and I have colored her with distress inks and water (I love stamping, and that is my prefered coloring technique). Bike is cut with Cricut and Every Day Paper Dools. 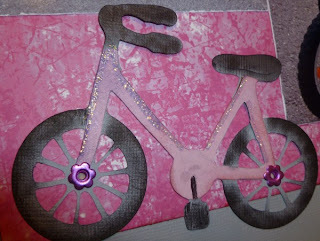 Cut an extra layer of pink to make some dimension and to make it look like DDs bike. Also adjusted it to be a more girly bike and added eyelets in the wheels. Thank you for dropping by. I hope you will join us in this weeks challenge at SOUS and visit the other designers! You id a wonderful job! Love the cute stamp image and love your colors! Hi Stine! I think this is darling and gosh, I just love that little image...and always and having the pleasure of having some of your handmade cards, your coloring is simply beautiful! Wonderful job, Stine. 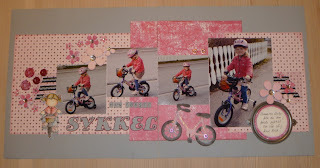 Love the pink bicycle! You glammed it up good. So glad to have you on the team!